This website is updated regularly. Please keep checking back. Thank you. Vote NO on Measure B, El Segundo's Bait-And-Switch TOT Tax Hike. The election in El Segundo is on Tuesday, April 12, 2016. POLLS OPEN at 7 A.M. AND CLOSE at 8 P.M.
Jump to Clearing Up the Confusion About Measure B and the City Council Election. Jump to Measure B is Not About Safety. Jump to Sample Ballot Argument Against Measure B. Jump to Sample Ballot Rebuttal to Argument in Favor of Measure B. Jump to Who Else Opposes Measure B? Jump to Frequently Asked Questions (FAQ). Jump to More Election Information. Jump to Which City Employee was paid nearly $600,000 in his last year? Many voters find this El Segundo City Election confusing. The Police and Firefighter Associations (Unions) are bankrolling the "Yes on Measure B" tax hike campaign with many thousands of dollars, to put millions more tax dollars in their paychecks and pensions. But they are also taking a position supported by Measure B opponents and other fiscal conservatives in the City Council election. The Police and Firefighter Unions, and leading fiscal conservatives, including Measure B opponents and critics of the excessive Police and Firefighter compensation , all want to to see City Council incumbents Marie Fellhauer and Dave Atkinson replaced by the challengers. The Police and Firefighter Unions have endorsed and are spending thousands of dollars campaigning for the three challengers. And leading tax hike opponents are supporting two of those challengers, Carol Pirsztuk and Don Brann. The Police and Firefighter Unions have consistently supported tax hikes on residents and businesses, to put more of our money into their paychecks and pensions, no matter how excessive and unsustainable. Incumbents Fellhauer and Atkinson voted for at least twelve tax hikes which the unions supported. Felhauer and Atkinson supported the Chevron Shakedown, which was also supported by the Police and Firefighter Unions. It was started by their allies, former Mayors Eric Busch and Bill Fisher, to effectively extort an additional $8.5 million average per year for 15 years from Chevron, without justification. Felhauer and Atkinson refused to do a cost-versus-benefits analysis, to study whether Chevron is paying too little, just right, or too much taxes based on the amount and cost of City services they use. The massive Chevron refinery property has no City infrastructure to construct, operate, and maintain, such as streets, sidewalks, water mains, sewer lines, street lights, landscaping, parks, swimming pools, etc. And there is no cost to the City for police patrols, trash collection, and street sweeping on the Chevron property. The Chevron Shakedown was started by Eric Busch and Bill Fisher on the basis that Chevron cannot move their refinery, as revealed in City Hall emails released under a California Public Records Act request. See PublicSafetyProject.org for more information on the April 12, 2016 El Segundo General Municipal Election. Measure B is Not About Safety. It's about further enriching the police and firefighter union members at taxpayer expense. Public record documents show El Segundo police and firefighters are paid total compensation of about $150,000 to more than $350,000 each per year, and can retire after only 30 years of service at age 50 (police) or 55 (firefighters) with a CalPERS pension paying up to 90% of their single highest year salary. Their pensions commonly pay out $100,000 to more than $200,000 per year, for a total of more than $4 Million each retiree. One El Segundo police employee, David Cummings, got a 23% pay raise and got paid a total of nearly $600,000 in his last year, and collected a CalPERS pension of more than $200,000 per year, guaranteed by the taxpayers for life. CalPERS actuarial data shows that, on average, police and firefighter employees live just as long after their retirement as miscellaneous (non-safety) employees. The City employees' CalPERS pensions are Defined Benefit Plans, meaning they pay out their lavish pensions to retirees regardless of investment fund performance, and the taxpayers must pay more taxes to meet any shortfall if the investments are poorly managed or otherwise perform poorly. In contrast, private-sector employees have Defined Contribution Plans such as 401(k) plans, where the periodic amount paid into the fund is defined, not the amount paid out during retirement. If a police officer or firefighter claims a disability upon or after retirement, real or fictitious, as 55% of El Segundo police officers and firefighters do, then half their pension is tax-free. Public record documents further show that El Segundo taxpayers have been paying about $40,000 to $85,000 into the CalPERS pension each year for each individual police officer and firefighter. The police and firefighters pay almost nothing into their own pensions. The taxpayers have even been paying the employee CalPERS pension contribution, in addition to the employer contribution, for police employees. Imagine if you had a 401(k) retirement plan at work where your private-sector employer paid in to your 401(k) account $40,000 to $85,000 each year, and you only had to pay a few thousand dollars, or nothing at all. Private sector employers will typically match employee contributions dollar-for-dollar, 75 cents on the dollar, or 50 cents on the dollar, up to a maximum of perhaps 2% to 7% of their income. Most or all of the Measure B tax hike money will go right into police and firefighter paychecks and pensions. The El Segundo Police and Fire Unions waged a dirty, dishonest labor contract campaign that included ELEVEN half-page campaign ads in the local El Segundo Herald newspaper, two citywide campaign mailers, and even a mobile billboard driven around town. They claimed "We don't want raises." However, the Police and Fire Union contract negotiation offers and counter-offers posted on the City's website at ElSegundo.org show they were demanding pay raises. The firefighters agreed to a new contract giving them new pay raises, on top of their greatly excessive and unsustainable compensation and past raises. And the police officers are holding out until after the election for even bigger raises. The El Segundo Police Officers' Association (the police union) and the El Segundo Firefighters' Association (the firefighters union) are bankrolling the "Yes on Measure B" campaign through their union PACs, just as they bankrolled the "Yes on Measure A" campaign to raise our taxes and their pay and pensions back in 2012. We defeated Measure A, and now we must defeat Measure B. 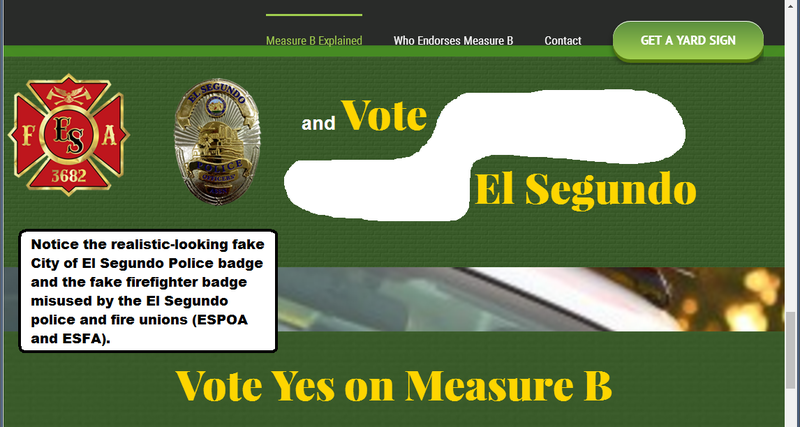 The El Segundo Police and Fire Unions are misusing realistic-looking fake police and firefighter badges on their "Yes on Measure B" campaign website. They are impersonating on-duty police officers and firefighters on official City business. This is highly dishonest and unethical, and perhaps illegal. "©2016 Paid for by El Segundo Firefighters PAC & El Segundo Police Officers Association PAC"
You may recall that Measure A was ELEVEN tax hikes in one ballot measure, on residents and businesses, on the April 8, 2014 El Segundo city election ballot. It would have created new taxes on residents for water, sewer, gas, electricity, and all forms of "communication services" including landline and wireless telephone, Internet, DSL, Cable TV, and Satellite. City Council candidates Marie Fellhauer, David Atkinson, and Drew Boyles ALL officially endorsed Measure A and appeared in campaign mailers promoting Measure A. They have also publicly supported Measure B, the 50% INCREASE in the Hotel Transient Occupancy Tax (TOT). Only City Council candidates Don Brann and Carol Pirsztuk did not endorse or support Measure A. VOTE NO on Measure B, the BAIT-AND-SWITCH Tax Hike. The City lured hotels with a Business Attraction Program and a lower competitive Hotel Transient Occupancy Tax (TOT). Measure B is a whopping 50% INCREASE in the TOT, from 8% to 12%. The TOT is IN ADDITION to the existing property tax, business license tax, and Utility Users Tax (UUT) on hotels for electricity, water, gas, and all “communication services”. Measure B is PERMANENT! There is NO SUNSET CLAUSE (expiration date), even though new development should provide millions in new City revenue, in addition to millions more from Chevron. There is NO GUARANTEE any new tax money will go to infrastructure! Even if some of the new taxes are used for infrastructure, where will the rest be spent by future City Councils – on even HIGHER SALARIES, BENEFITS, AND PENSIONS? There is NOTHING in Measure B to control discretionary spending. TWO WRONGS DON’T MAKE A RIGHT. It’s not right to charge high taxes just because “other cities are doing it”! ALL TAXES COMBINED are MUCH TOO HIGH! Residents already voted down residential trash fees, the Measure O tax hike, and the Measure A resident and business tax increases that were excessive, but City Councils keeps coming back for more money. The City Council majority can change every two years. Any future majority can reverse cost savings from a previous majority and lock-in the City to irresponsible cost increases for many years, expecting to raise taxes and fees on businesses and residents. VOTE NO on Measure B to tell future City Councils they must be responsible with taxpayers’ money. City Hall should be open on Fridays. VOTE NO on Measure B to tell Businesses that El Segundo is Stable and OPEN FOR BUSINESS. Visit NoOnTaxHike.com regularly for more information. VOTE “NO” on Measure B.
Don’t be fooled by misused economic terms and cherrypicked data! Taxes are not at “market rate” when politicians unilaterally impose them and use government’s police power to forcibly collect them. Measure B will DESTROY El Segundo’s competitive edge and longtime reputation as a business-friendly city. Hotel room rates and TOT revenue have increased significantly since 1996 (20 years). Annual TOT revenue is UP $1.5 MILLION (38%) since FY 2009-10 WITHOUT RAISING TAXES (see elsegundoca.OpenGov.com). The proposed 12% TOT will place El Segundo at 24% above the 9.69% average for 483 California cities and counties. TAX PERCENTAGE RATES should not keep increasing to pay for excessive increases to already unsustainable government employee salaries and pensions that far exceed the private sector. Measure B is TAXATION WITHOUT REPRESENTATION because it taxes hotel guests who can’t vote on it. The City Attorney said a resolution on how to spend the money IS NOT BINDING, and only language in the ballot measure can be binding. City Council chose the NONBINDING route! The hotel industry doesn’t need hotel tax hikes to “promote tourism”. City Council raised Chevron’s taxes by more than $8.5 MILLION average per year for 15 years in 2013. Development of the 142 acre Raytheon property will provide El Segundo with $5 MILLION in fees plus an estimated $2.6 MILLION annual tax revenue increase. VOTE “NO” on Measure B! Who Else Opposes Measure B? City staff met with representatives from seven hotels located in the City. The consensus among the hotel representatives was they could accept at most a 10.5% TOT, with 0.5% of the TOT being used annually for travel and tourism enhancement, under the belief it would improve the City's financial condition. (Source: 12/1/2015 El Segundo City Council Meeting Agenda Packet, pages 412-413.) However, the new tax hike money will go towards police and firefighter pay raises and pension increases. He voted for to put Measure B on the ballot, realized he made a mistake, changed his position, completely opposes Measure B, and did not sign the Sample Ballot argument in favor of Measure B. He voted against the 12% tax hike in Measure B, stating it was too high and he would support at most a 10.5% TOT tax rate. He later voted to put Measure B on the ballot and signed the Sample Ballot argument in favor of Measure B because he supports the general concept of raising the TOT, if not raising it to 12%. He fully opposes Measure B and will vote against it. He did not sign the Sample Ballot argument against Measure B due to health reasons. QUESTION: Why don't the El Segundo hotels support Measure B? ANSWER: Because they know as you increase the price to the customer, sales go down, and because City Council Members Marie Fellhauer and Dave Atkinson put a 12% TOT tax in Measure B when the the hotel operators said the most they could accept was 10.5%. However, the hotel operators probably did not know that the City pays its police and firefighters total compensation of $150,000 to more than $350,000 each per year, with more than $4 million pensions and full retirement at age 50 (police) or 55 (firefighters). QUESTION: Why are the Police and Firefighter Unions bankrolling the Measure B tax hike campaign? ANSWER: Because they endorse, contribute to, and campaign for the candidates and ballot measures that greatly raise their pay and pensions, no matter how excessive and unsustainable, and raise our taxes to pay for it. It is a total conflict of interest for government employees to campaign for candidates and ballot measures that increase their pay, pensions, and benefits, and raise taxes to pay for it. It is an even bigger conflict of interest for sworn police and firefighter employees, because they hold positions of authority and public trust. Their dishonesty and deceitfulness during their election campaigns begs the question, how can we trust them to be honest on their jobs? QUESTION: Is this the first time the El Segundo Police and Firefighter unions have campaigned in our local city elections? ANSWER: No. The El Segundo Police and Firefighter unions have campaigned in our local elections for decades, going back at least to 1992. They bankrolled the campaign for Measure A in 2014. The police and fire unions contributed $10,000 for Measure A, and they encouraged two other city employee unions to contribute another $7,500, for a total of $17,500. Measure A was eleven tax hikes in one ballot measure, on residents and businesses. It would have created new taxes on residents for water, electricity, gas, and all forms of "communication services", including landline and wireless telephone, pagers, Internet, DSL, Cable TV, and Satellite. A large majority of El Segundo voters rejected Measure A. The firefighters' union put Measure P on the ballot in 2012. It would have hijacked our local fire department by disbanding it and forcing our city to contract with the Los Angeles County Fire Department for an inferior level of service and nearly double the hospital transport times. But it would have locked in and protected the firefighters' huge compensation, including the big raises they got during the Great Recession. The firefighters' union spent more than $100,000 on Measure P, on a professional campaign consultant, legal fees including a lawsuit against our City, and a telephone poll and two tracking polls. But after our grassroots campaign against Measure P, 90.1% of El Segundo voters rejected Measure P.
QUESTION: How big were the firefighter and police raises during the Great Recession? ANSWER: The El Segundo firefighters and police got 11.25% to 32.3% in pay raises for a three-year contract period during the Great Recession. The raises were approved by City Council members Eric Busch and Bill Fisher, whose campaigns the police and fire unions funded and supported. QUESTION: How many El Segundo police and firefighters live in town? ANSWER: None of the firefighters and only about one-fourth of the police live in town. QUESTION: Are the police and firefighters allowed to use taxpayer-paid time and resources to campaign in our local elections? ANSWER: No, but they do it anyway and get away with it. There is conclusive proof that the El Segundo Firefighters' Association (fire union) used public facilities (Fire Station #2) and taxpayer-paid time to campaign for Measure P in 2012. The police and firefighter union contracts give the unions a large amount of taxpayer-paid time, at their enormous compensation rates, to conduct "union business". This has been ruled an unconstitutional gift of public funds in at least one other state. The firefighters, and probably also the police, use substantial additional paid time for their members to attend "union meetings" where they conduct political campaign activities. They are allowed to hold their "union meetings" in private in City public facilities. If you see or know of police, firefighters, or any other City employees misusing taxpayer-paid time and/or public resources for political campaign activities, you can collect evidence such as photos or video with a cell phone (make sure you follow all laws when recording video that includes audio recording in California), and you should report it to Mike Robbins, Mayor Suzanne Fuentes, Mayor Pro Tem Carl Jacobson, the City Attorney, the City Manager, the City Clerk, the Los Angeles County District Attorney, the California Attorney General, and the California Secretary of State. You can also report it to local newspapers. QUESTION: Why are there no "NO on Measure B" campaign signs? ANSWER: For the same reason there were no "No on Measure P" and "No on Measure A" signs. The "NO on Measure B" campaign is a low-budget grassroots campaign. It is not funded by wealthy police and firefighters getting paid total compensation of $150,000 to more than $350,000 per year. Also, many voters are intimidated by the police and firefighters who don't even live here, but campaign in our local elections for City Council candidates, ballot measures, and tax hikes that will give them bigger pay raises and pension increases. Residents fear possible retribution, including delayed or withheld police and fire service in an emergency, and possible harassment. QUESTION: Can we trust the police and firefighter unions polls? ANSWER: No. We can't even trust the police and firefighters on anything related to election campaigns, what they really get paid, how much they really want to get paid, and how high they want to raise our taxes to pay for big raises. Their polls are usually biased. And they polled voters before they received their sample ballots with the Argument Against Measure B and the Rebuttal to the Argument in Favor of Measure B. Which City Employee was paid nearly $600,000 in his last year? One El Segundo police employee, David Cummings, got a 23% pay raise and got paid a total of nearly $600,000 in his last year, and collected a CalPERS pension of more than $200,000 per year, guaranteed by the taxpayers for life. Generally, El Segundo sworn police officers, from lowest level Police Officer up to Police Captain, and Police Chief, are by far the highest paid city employees except for sworn firefighters. Police Chief David Cummings was by far the highest paid city employee in calendar year 2009. Former El Segundo Police Chief David Cummings, who retired in 2009 with about eleven weeks left in the year, had total 2009 compensation of about $596,657, including his city contract and CalPERS pension income while he continued working as the El Segundo Police Chief after his retirement. Cummings' post-retirement City employment contract acknowledged that he would be receiving his $210,000 per year CalPERS pension income while he continued working as the City's police chief after his retirement. Below are two tables, one showing how former El Segundo Police Chief David Cummings was paid a total of at least $596,657 in 2009, and the second showing how Cummings' salary, vacation and sick leave payout, and pension were all spiked by the 23% raise he was given about a year before his retirement. The following is an in-line HTML table containing the formatted spreadsheet data of former El Segundo Police Chief David Cummings' calendar year 2009 total compensation and pension income. Note: This Public Records Act request data was provided by the City of El Segundo, California on December 15, 2010 in response to a PRA request made by Michael D. Robbins on December 5, 2010. It is provided here as a courtesy of Michael D. Robbins and the Public Safety Project, P.O. Box 2193, El Segundo, CA 90245, PublicSafetyProject.org. The estimated (calculated) data and additional data annotations were provided by Michael D. Robbins. Police Chief David Cummings received a 23% pay increase effective October 1, 2008, about a year before his retirement, which spiked his 2009 total earnings and leave payout, and his annual pension. The raise spiked his regular earnings by $42,190 (from $183,437 to $225,627), and his accumulated vacation and sick leave payout (cash-out) value by $37,336 (from $162,332 to $199,668), for a total earnings spike of $79,527. His annual pension was spiked by an estimated $39,308 (from $170,905 to $210,213). Police officers and firefighters are credited and allowed to accumulate and roll-over from year to year huge numbers of vacation and sick leave hours, which can be cashed out at a higher pay rate in later years and upon retirement. His total 2009 earnings was $425,775 - consisting of $225,627 Regular Earnings, $480 Special Compensation, and $199,668 Leave Payout. He retired in 2009 with a pension of $210,213.36 yearly ($17,517.78 monthly) according to CaliforniaPensionReform.com, plus medical insurance, for the rest of his life. The following table summarizes Police Chief David Cummings' spikes resulting from his 23% raise. The reason given for Cummings' 23% pay increase that spiked his pay, leave payout, and pension was salary compaction, also known as salary compression, caused by large pay increases given to the police union members. Please Vote NO on Measure B for the above and many other good reasons. Copyright © 2016 by Michael D. Robbins.